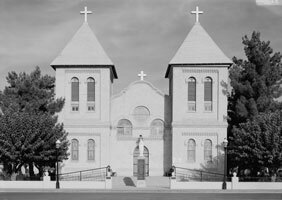 The Church of San Albino, built in 1906, occupies the location of an 1857 adobe church and is one of the oldest churches in Mesilla Valley. The church is built of fired brick with a belfry facade on each corner. Leaded stained glass windows depicting saints and geometric designs line the walls of the nave. The parapet between the belfries bears some resemblance to the Mission Style. Both the interior and the exterior walls were stripped of their plaster during renovation and stabilization in the 1960s. The Historic American Buildings Survey documented the structure in 2005.